Buildings and people have a strange way of resembling each other. Some houses are sassy and coquette like 15-year-old girls, while some are somber and grave like monks. Many seem to miss the “good old days” of times gone by with the use of cosmetics. The soundness and adherence to “good form” in the architecture of some banks remind us of the Orthodox head of a household, while dwellings, which in their modernity show exposed beams, bricks and various building elements, are reminiscent of young men who like to show off their sinewy torsos, barely contained in tight T-shirts. There are Art Nouveau faces and facades that seem to be clad in wedding dresses or ornamented in the style of birthday cakes with swirling meringue decorations, and some walls are sad-looking and undecorated like “International Style” ladies. These similarities are what Surcos de la ciudad [Furrows of the City] seems to refer to. 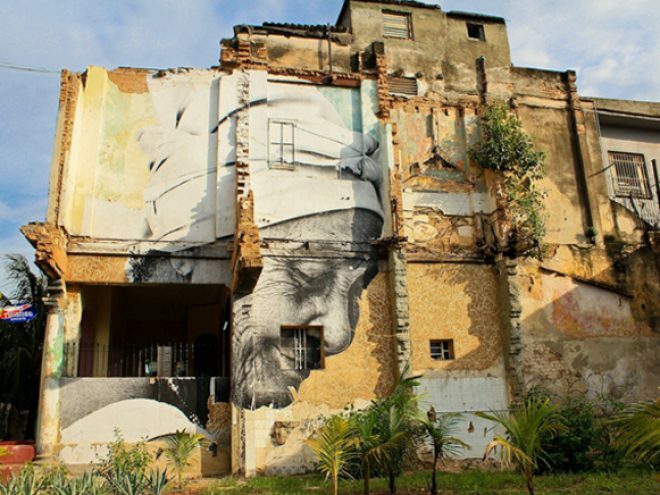 This project by renowned artists JR (France) and José Parlá (US), exhibited during the 11th Havana Art Biennial, which took over the city’s public spaces, can still be enjoyed by locals and visitors. Twenty-five elderly Cubans were photographed by JR and their faces were reproduced on a number of old walls in Old Havana, Central Havana and El Vedado, which offer splendid mediums for this photographic hyperrealism, accompanied by calligraphy, scribbles and other interventions by Parlá. This is a project that the artists have carried out in other cities in the world. The marks that time leaves are replicated shamelessly on faces and walls. Lines and creases certify the devastating passage of time and dignify it. Far from the glamour of giant billboards that are usually displayed in large cities, JR has explained his intentions: “I want to turn the spotlight on anonymous people. Take their faces onto the streets and redefine the notion of hero.” These are the nameless, everyday heroes who take over streets, take on the physical wear of human beings and the buildings that give them shelter, and proclaim in full view of everyone their failures and hopes, whether by the heaviness of half-closed lids or in the hint of a smile. Parlá and JR provide a dialogue between the city and its people. They encourage viewers to imagine the exciting stories that can be hidden behind the anonymity of old faces and precarious buildings in pieces that have multiple interpretations, and which both draw attention to the architectural deterioration in many areas of Havana—in need of the restorative force that takes place in the capital’s historic center—and alert, with the synthesis and passion that art provides, about the ageing Cuban population, a phenomenon that has already been discerned by sociologists and demographers. But beyond the personal interpretations of each person, the elderly people of Surcos de la ciudad, who, pensive, sorrowful or optimistic, despite everything, look on and let themselves be looked at from crippled walls, remind us how much men and their houses, the city and its inhabitants can resemble each other.